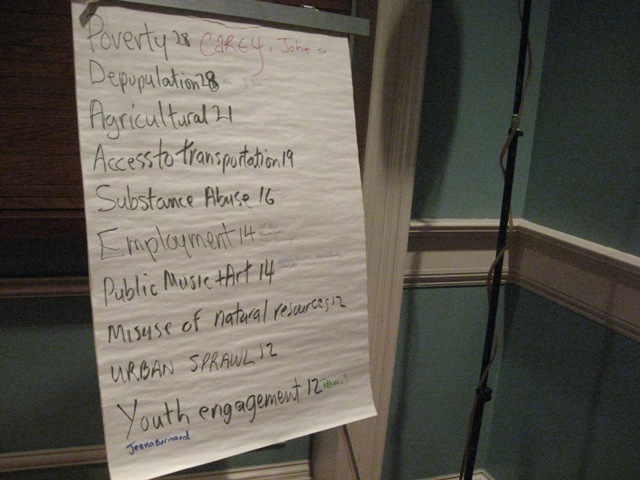 Major issues in Cape Breton, as identified by youth aged 17-34 at the Social Enterprise Boot Camp. I stopped by the side of the road and took this shot, on my way home Sunday afternoon. Yes, I drew in the dust on my car. Yup. I know. Big dork. Right here. This is me giving my speech on Friday night. Thanks Christy for taking the pic with my camera! I spent this past weekend at an event called the “Youth Social Enterprise Boot Camp”. 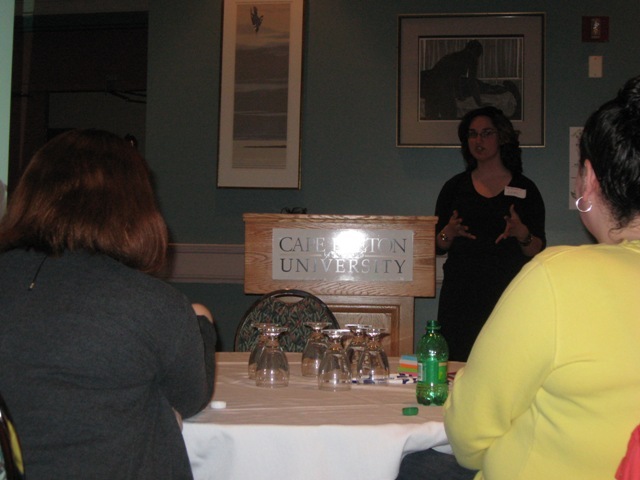 It was at Cape Breton University, and sponsored by other community organizations (which I’ll list in tomorrow’s post). I was a keynote speaker, but I also participated in the weekend. It was – amazing. Huge, actually. I think it might have changed my life! I’m not sure yet – it’s too soon – but, I just know that I felt so amazed and energized and downright HAPPY the entire time. I’ll post more about the event tomorrow, once I’ve had more time to gather my thoughts (and get some rest!). “Thank you [to introducer]! And hello everyone. First of all, I just want to say how excited I am to be here tonight. This is a great event, and a real opportunity for all of us nurture our dreams. This event wouldn’t be possible without the hard work of Tim Damon and the other folks who put this together. Let’s give them a round of applause! My name is Leah Noble and I’m a writer. 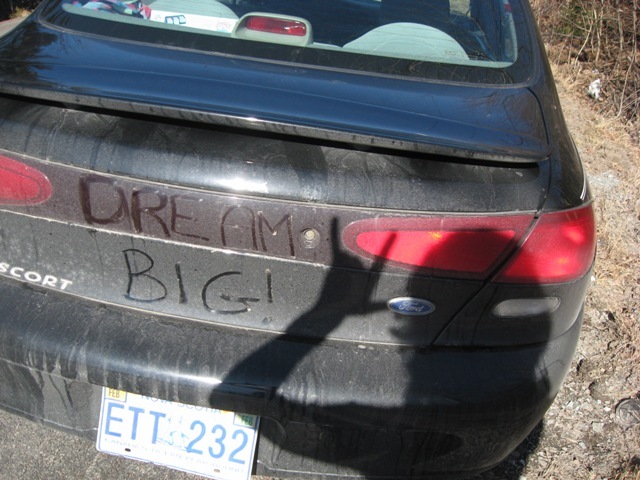 I grew up in Baddeck, and live there now, and I write a blog called Dream Big Cape Breton. Tonight I’m going to tell you a bit about my story, about the blog, and what it’s teaching me about Cape Breton and the future here. And the thing is, with writing, is that no-one ever comes up to you and says “Here’s your certificate, you are a writer. You can now go out in the world and say that you are a writer.” There’s no test to pass. I suppose the goal is to publish a book, but I didn’t have a book. I had… some short stories, some poems, and a personal, small blog that I wrote for friends. Then, in 2007, in my third year of studying for a BA, in New Brunswick, I started suffering from really bad anxiety and ended up falling into a depression. It made me rethink everything in my life. It made me reconsider what it was that I needed to be happy. I realized that one of the things I needed was to be home, in Cape Breton. The wilderness here is my church, my sacred space. There is a ruggedness and a beauty here, that goes beyond words. Cape Breton is the love of my life. So I moved home. I thought, “Yeah, this was a bright move! Come back to Cape Breton in mid-March.” All of the young people I used to know were gone, had moved away. My town is a tourist town, and in the winter it’s pretty quiet. But it ended up being OK. And looking back, it’s the best thing that ever happened to me. I started out by hanging out with seniors. They were the only ones I knew anymore. But that was good, I drank lots of tea, played a lot of crib. I got really good at counting hands – 15-2, 15-4, 15-6, pair is 8..
One thing the seniors taught me was the sense of history. They would tell me stories about the fifties and sixties, and I got a real sense of what Cape Breton was like, and of what life was like then. And of how fast things can change. The landscape stays the same, but the society can really change. I started to get better – I think it was all the tea – and I started volunteering in the community, and then I started back to work. I got short-term jobs – a grant paid me to teach computers to seniors, so I called on my crib buddies to sign up for the class – and then a part-time job, and then full-time, seasonal work. I was asking myself, what are my dreams? What do I want out of life? My dream was I wanted a little house, I wanted to be able to have a garden, support local farmers, and work a year-round job that I really loved. It’s not a crazy dream, but the way our economy is right now, I doubted whether I could make that dream come true. And I know I’m not the only one. All over the island, young people that I meet – We’re all trying to figure out if there is a future here for us. Can we make a life here? Can we have enough food to eat? Can we make enough money? Can we live our dreams here? These are very valid questions! These are not just theoretical, this is real life. So last year, I started dreaming about writing something other than poems that no-one would publish, or a personal blog. I started dreaming a little bigger, and getting really excited about the idea of interviewing people about their lives and their experiences here in Cape Breton and tell our truth, our generation’s truth. I wanted to look beyond the image of Cape Breton that gets sold to tourists and I wanted to talk about what it’s really like to live here. Year-round. Trying to make a living. Dreaming about the future and trying to make those dreams reality. So I started a Facebook group that was meant to be sort of a mailing list, to link people together that I would interview, but it took on a life of its own. People in the group started to post things to the wall… links to events, and information about neat, alternative sort of things that were happening. The overlying narrative of Cape Breton right now is of death and failure, that we’re all moving away, that this place has nothing, no future, and there’s nothing exciting here. It’s a tourist playground and that’s about it. Yet our reality, our truth, is more complex than that. We’re young, energetic, we’re excited! So I jumped in and started doing interviews, and started my blog. Doing that forced me to say “I’m a writer” when I meet people. That’s scary, because it takes confidence that I don’t always feel. But, it showed me that I can do that – that I can decide for myself what I am. I determine my own future. Starting the blog was only two months ago and I’m having such a good time. I’ve spoken to a couple who is starting an organic microbrewery near Baddeck. I’ve spoken to other couples who have moved here from elsewhere in Canada, from the US, from the UK, to make their life here. I’ve spoken to musicians and people employed by government. I’ve got three contributors now and I’m hoping for more. I honestly wish I could be writing this blog 24 hours a day, seven days a week because there is so much material here! When you really start to look, there are people all over this island who are doing amazing things. Whose lives – even if they think their lives are small – by simply being here, they’re resisting that overlying, negative narrative. All of this activity, to me, in my head, I see it as – the island, Cape Breton Island. If you could put little dots all over it, and each of those dots is a person, who’s living here, who is making their way, who is either from here originally, or a newcomer, or whatever they are, they’re all there. And by ourselves, we can feel isolated, we can feel like no-one else cares and that no-one else is doing anything positive. But, through social media, through my blog, through other means like this weekend, we connect outward from our communities, connect with each other, and it’s like those dots light up. We’re starting to light up the island with our energy and our power. That helps us to see ourselves in a more positive light. That helps us to realize that we can define ourselves. We aren’t waiting for someone else to do it. We’re doing it ourselves. And it’s so exciting. I can’t wait to see what happens. This entry was posted in Leah's thoughts and tagged Cape Breton, Cape Breton University, public speaking, social enterprise, training, youth. Bookmark the permalink. Leah, that was gorgeous, wish I was there! As I recently stated in a reply to one of your blogs, the greatest resource that Cape Breton has is it’s young people…people like you, people like my daughter who’s studying nursing at CBU, like the girl next door or the young guy who lives up the street. Education is where it’s at, and through this blog of yours’, by bringing us all together, you’re educating us all. You’re creating the Classroom. Far too often young people as a whole are given a bad rap because of the news on page 3 or 4 of the Cape Breton Post…”drug trial set for..; 2 youths arrested for…; teens arrested for…”, but there are sooooo many of your guys who are doing really great things. You have real heads on your shoulders. As I told my children when they were growing up (something I never want to be accused of), was to recognized the goons, and avoid them at all cost. You can’t go through them, you can’t go over them, so you go around them! Easy! It warms my heart to see you guys out there doing good things, like this blog. My hat’s off to you guys and my boat is always open.